An Identifiable Flaw | McDermott Law Firm, P.A. Ricardo Thomas, 5-foot-10, 170 pounds, spent 19 months in jail after a witness identified him as a carjacking suspect. 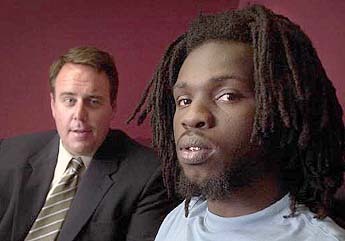 But a bank robbery suspect later confessed to the crime and told Thomas’ lawyer Frank McDermott, left, that Thomas is innocent. LARGO — The eyewitness never wavered in his identification of two suspects involved in a St. Petersburg carjacking last year. “I’m in fear of my life over this and believe me, I’m going to remember something that’s making me fear for my life,” the witness told lawyers. Based primarily on the witness’ identification, both suspects were arrested and charged with carjacking. They faced life in prison and spent more than a year in jail awaiting trial. Then earlier this year, the witness’ memory came suddenly into question. An accused Polk County bank robber confessed to the carjacking and said the two men charged with the crime were innocent. Now attorneys for the two suspects, Ricardo J. Thomas and Dangelo Q. Hutchinson, both 22, say their clients are the victims of the witness’ faulty memory. And prosecutors are considering dropping charges, though they stop short of saying the suspects were wrongfully accused. Upon hearing of the confession, a Pinellas circuit judge released Thomas on his own recognizance Friday after 19 months in jail. Hutchinson was already free, spending 15 months in jail before his release on $20,000 bail in February. It’s the latest Pinellas case to cast the spotlight on the reliability of eyewitness identification. Pinellas sheriff’s deputies misidentified a woman in 2000 and charged her with selling crack cocaine. She spent 81 days in jail before deputies uncovered their mistake. Another spent several hours in jail in 1999. He then spent a year clearing his name before prosecutors dropped a drug charge against him based on a misidentification by Pinellas deputies. Contez Caldwell, 25, was visiting an auto repair shop late in the evening of Sept. 11, 2000, when a white car came toward him. Four men approached, demanding the keys to the car he was driving. One of the men shot him in the back, a wound that was not life-threatening. The shooter made off with his keys. Caldwell told police the faces of three of these men were covered and he could not get a good look at them. He saw one face but was later unable to identify the man. But police found a witness: David Hayslip, owner of the auto shop that Caldwell was visiting at the time of the shooting. He said he saw some of the assailants’ faces. Hayslip said the day after the carjacking, four men driving a white car visited him at his shop on Dr. M.L. King (Ninth) Street S. He said he recognized the carjackers among them. The four men, Hayslip told police, feared he had identified them to police, and they threatened him. They told him he had the wrong men. After the four men visited Hayslip, police showed him a series of mugshots: He identified Thomas and Hutchinson as the carjackers and the men who visited him. “I’m sure that there aren’t too many people that got the same looking face,” Hayslip told lawyers. When police picked up Thomas, he admitted he and three buddies — not including his friend, Hutchinson — confronted Hayslip after hearing rumors in the neighborhood that Hayslip had identified him. It didn’t help that both Thomas and Hutchinson had minor criminal records. Among several of Hutchinson’s convictions was a charge for possession of cocaine, while Thomas had a record of misdemeanors, mostly for trespassing. But the case against the men was about the take a dramatic turn. Last year, federal authorities executed a search warrant at the home of Yves Mathieu, 21, of Lakeland, as part of an unrelated investigation of a bank robbery. Authorities found the rims and stereo from the St. Petersburg carjacking. Much earlier, they had found the burned out car within miles of Mathieu’s home. At first, Mathieu denied involvement in the carjacking, saying he bought the stolen items from someone else. Then at a deposition earlier this year, he told McDermott to visit him in the jail. Mathieu wanted to get something off his mind. On April 11, he confessed to McDermott that he and several friends carried out the carjacking. He said the friends were Jonathan Gaines, Alexander Contreras and Jason Ashby. The men, who deny they committed the carjacking, already were in jail on other charges. Mathieu said he knew neither Thomas nor Hutchinson. He said they were innocent. Mathieu later repeated the confession to a St. Petersburg detective. “It kind of complicates things when someone else steps forward and confesses to a crime you have charged someone else with committing,” said Carl Watts, a St. Petersburg officer who investigated the case. “It definitely makes it a case that’s hard to prosecute at this point,” he said. Pinellas prosecutor Kendall Davidson said no decision has been made on dropping charges against Thomas and Hutchinson, though he acknowledged the case would be difficult to prove now. Thomas is just happy to be free again.